Illustration of sequential stratification method for 4 hypothetical patients. Finding controls for each sevelamer initiator using the example illustrated. Patient 1 could be matched to patient 2, 3, or 4 (if similar mortality risk at sevelamer initiation), with mortality follow-up beginning at time of sevelamer initiation for patient 1. All were alive and as-yet-untreated at the time patient 1 initiated sevelamer. Follow-up for patient 3 would be censored at time of sevelamer initiation. Patient 3 could be matched to patient 2 only (if similar mortality risk at sevelamer initiation), with mortality follow-up beginning at time of sevelamer initiation for patient 3. Patient 4 had already died at the time patient 3 initiated sevelamer. Patient 1 had already initiated sevelamer and thus is not an eligible control after this point. SEV, sevelamer. Flow chart illustrating study inclusion and exclusion criteria. 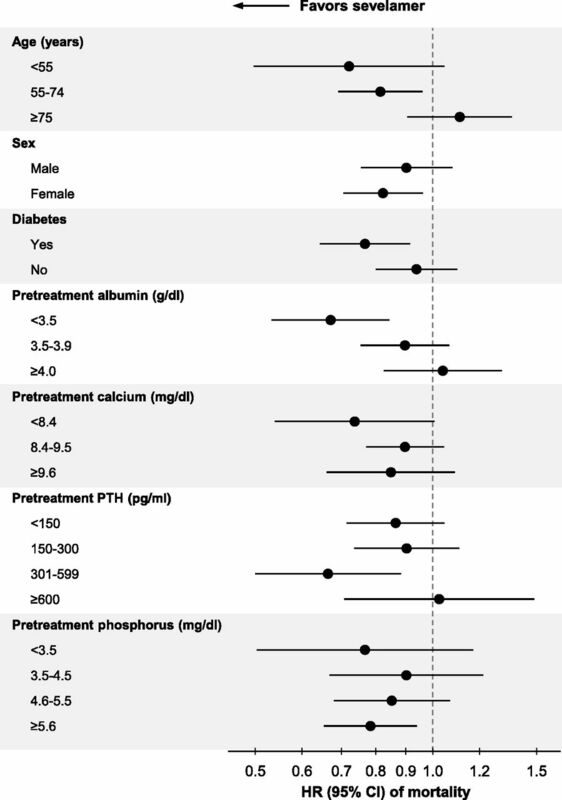 Ca-PB, calcium-based phosphate binder; DOPPS, Dialysis Outcomes and Practice Patterns Study. Levels of biochemical parameters before and after sevelamer initiation. (A) Serum phosphorus. (B) Serum calcium. (C) Intact PTH. PTH, parathyroid hormone. 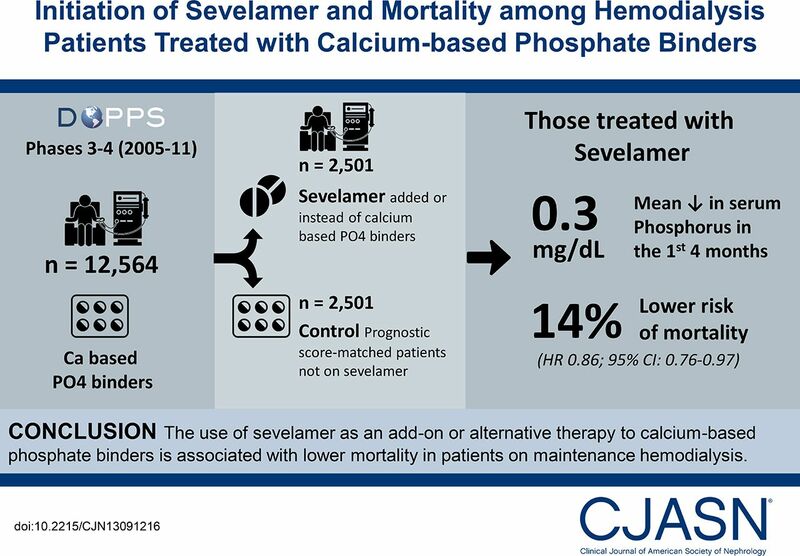 Stratified HRs (and 95% CIs) for mortality comparing sevelamer initiators with patients as yet untreated. To take into account the potential different categories for the control patients and their paired treated patients, differences between each control patient and their paired treated patient were also adjusted for in the model. 95% CI, 95% confidence interval; HR, hazard ratio; PTH, parathyroid hormone.